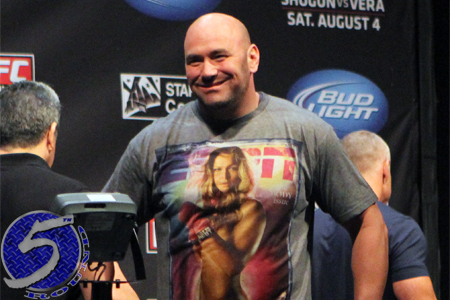 To say UFC president Dana White (pictured) had a great Saturday would be an understatement. The same night where he hosted “the best card we’ve ever done,” White’s beloved Boston Red Sox made the World Series in spectacular fashion, with buddy Shane Victorino hitting one of the most unforgettable shots in Sox Nation history. White was all business when talking about the edge-of-your seat action that took place at UFC 166, but he couldn’t help but put his fanboy cap on (which happened to have a red “B” on it) when he was asked about the drama that went down in Beantown earlier in the evening. “They’re down 2 to 1, it’s in the seventh or eighth [inning], Victorino, who has had a horrible post-season, gets up there with bases loaded and hits a grand slam home run, man. It’s so awesome,” a giddy White boasted. “Obviously, we’re very close to Victorino. Victorino is a longtime UFC fan, going to shows every chance he gets and constantly tweeting about upcoming fights. It was only fitting for White that Victorino was the one to pull off the heroic hit for his hometown baseball team on the same night the UFC hosted arguably the most thrilling fights in Octagon history. White’s Red Sox will open the World Series on Wednesday against the St. Louis Cardinals, the squad they swept in 2004 to end their 86-year title drought.